The conceptual idea of the project is to propose a cultural gastronomic center organized around the essential element of the cuisine: vegetable products raw materials. Specifically, the building is enclosed by a greenhouse containing a system of hydroponic farming, where grow fruits and vegetables. The relationship between the building and its vertical garden has several meanings. At first, the green facade acts as a sensory filter between the city and the cultural center and it also attracts / catchs the attention then this element makes the building identifiable. In addition, the facade wants to be part of the city, which could be defined as a gastronomic garden. This garden can be practiced as a promenade and have a pedagogical purpose. But above all, the greenhouse turns into a inspiration tool for the chefs which points out the vegetal element as a base of culinary creation. The glasshouse, which also contains the circulation, is implanted around the building volume, so it always maintains the contact (visual and / or physical) with the plant. The farming crop changes according to the season. Thanks to this greenhouse system, the façade is evoluating along the year and the seasons. Thus, for example, the façade reveals what kind of plant growns in each season so the building lives to the rhythm of the crops. 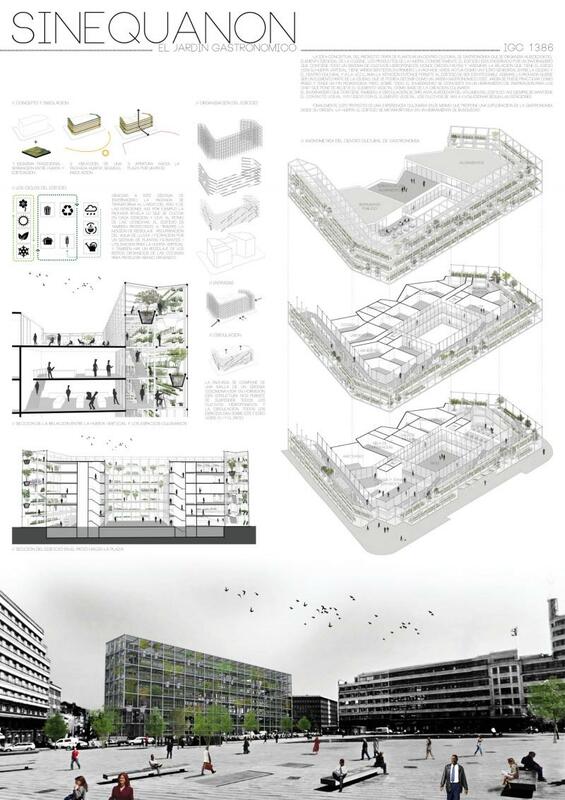 The project is also designed to improve the notion of recycling : rainwater recovery / filtration system by filtering plants / used on an for the vertical garden, there is also a recycling of organic debris from the kitchens to produce organic fertiliser. The façade is composed of a structure post / beam made of concrete. This architecture allows to suspend the hydroponic system and the circulation. All spaces give on this green filter or / and the courtyard which relates the building to the public square. Finally, this project is a culinary experience in itself which proposes an exploration of the gastronomy from its origin: the garden. The building metamorphoses into a research tool. Votre communauté a fait une grande contribution. Me parece una propuesta muy atractiva. La idea de jugar en la fachada con la materia prima de la cocina pienso que es muy seductora. Felicidades!